Session Bassist supreme Adam Nitti has appeared on several Grammy-Winning and Grammy-Nominated albums over the past two decades, and is reno.. Session Bassist supreme Adam Nitti has appeared on several Grammy-Winning and Grammy-Nominated albums over the past two decades, and is renowned for his meticulous tone. 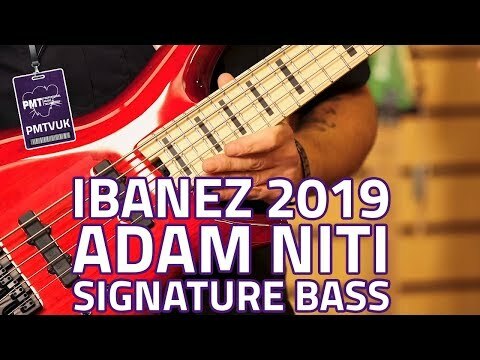 He now has his own signature bass - the Ibanez Adam Nitti ANB205 Transparent Wine Red Burst - and it's an absolute dream to play. With it's lightweight Swamp Ash body, complete with an extra scoop to the lower horn, playing the ANB205 is as comfortable an experience as you could wish for. Featuring a slim Maple neck and fingerboard, a set of Bartolini 59CBJD single-coil passive pickups, and a Bartolini NTMB+F preamp (modified to Adam's taste), the ANB205 is as high-performance and versatile as a session bassist could need. The "Classic Bass" Bartolini 59CBJD pickups are of a passive design, but feature an extended and more resonant frequency range. Specially designed with increased high frequency definition, without compromising on lows and low-mids, these pickups offer the kind of articulation that would certainly meet the demands of modern bassists. Complimenting the pickups is the Bartolini NTMB+F preamp, which has been specially modified to meet Adam's demands. In addition to fully independent Bass, Mid, and Treble controls, there's a 3-way Mid Frequency selector, and a passive tone trimmer which allows you to fine tune the basses brightness. In addition to offering a superb string-to-body energy transference, the Hipshot A Style Bridge on the ANB205 features a slightly-wider-than-usual string spacing. Usually, an SR-5 bridge would come with a 16.5mm string spacing as standard, but on the ANB205 this is widened to 18mm, which offers you plenty of freedom for different bass playing techniques without affecting your comfort levels. As you may have noticed mentioned above, and on some of the above images, this bass comes complete with a detachable finger ramp... but what is that? Well, have you ever noticed that your bass will sound different, depending on where you pluck the string, but unless you rest your thumb on a pickup it can feel a little awkward? A finger ramp can help you out with that. The finger ramp is ideal for helping you to develop your right-hand playing technique, especially if you find yourself needing to play fast from time to time. This little wooden block sits neatly between your pickups, and opens up a whole new range of sounds for you to play around with. Contact your local PMT Store or our Online Sales Team directly if you'd like to know more about te availability of this fantastic bass guitar. Don't forget, if you order it online you can have it delivered directly to your house, or arrange for an in-store pickup!